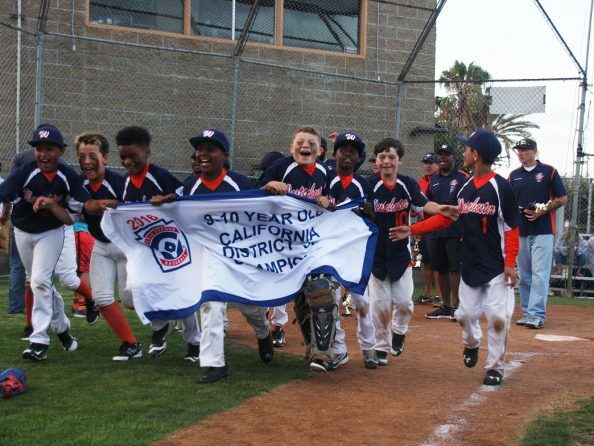 Formed in June, the team, composed of 9- and 10-year olds from Westchester Little League, bested 13 other all-star teams from Del Rey, Lennox, Wiseburn, Aviation Lawndale, Compton, Tri-Park and Hollypark to win the District 37 All-Star tournament. It was an impressive performance that saw the team go undefeated, while outscoring opponents 68-7 and advancing to the Section 4 All-Star Tournament. There, the Westchester squad lost its first game against West L.A., but battled back through the losers’ bracket to face West L.A. again in the finals. Westchester beat West L.A. in two consecutive games to become only the second U10 team from Westchester to advance to the North Sub Divisional State Tournament in Lompoc. Not anticipating the new travel expenses, the team scrambled to find funding for transportation to and from Lompoc. That is where the Gateway Los Angeles Business Improvement District stepped up to the plate. Executive Director Laurie Hughes rallied her members along with the Drollinger Family Charitable Foundation, LAX Kiwanis Club, Westchester Rotary Club and others to raise the money necessary to transport the team and coaches up north. In Lompoc, Westchester lost its first game to Sherman Oaks, but as they did in the previous round, battled back through the losers’ bracket to face Sherman Oaks again. This time, Westchester was eliminated in a tough, 12-8 defeat. Congratulations to the entire team: Jaxon Bernard, Dillon Bonner, Cameron Brewer, James Dell’Amico, Mason Edwards, Shane Florez, Jordan Garrett, Zachery Gresham, Jimmy Lincoln, Mckenzie Parks, Casey Richardson, Noah Smith and Jonas Woodworth; as well as Manager Chris Richardson and coaches Keven Dell’Amico, Lawrence Bonner, Tony Florez, Shane Woodworth and Ira Smith. Dell’Amico said the experience was about much more than baseball and added that the boys developed a camaraderie that will last forever. “They marched in the Fourth of July parade. They’ve practiced or played games almost every single day since the beginning of June. They have cooled off by running though the sprinklers before games on hot days. We have had team pool celebrations, and ultimately the boys have made memories and friendships for life,” she said.